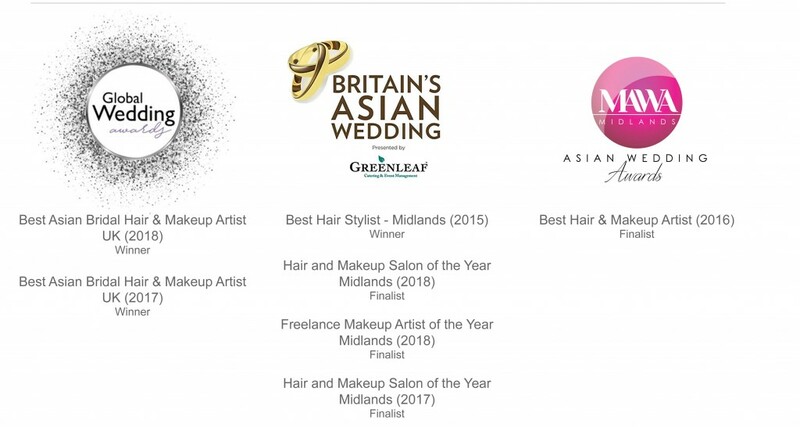 I only have positive feedback for your team as I could not have been happier with my hair and make-up on my civil ceremony and indian wedding day. My makeup artist was Pam and she did a wonderful job and made me feel so at ease and relaxed as I knew I was in good hands. As I explained to Pam, I had originally booked with a different makeup artist who had done bridal hair and makeup for my sister. As my big day was close approaching I knew in my heart this was not the makeup artist I wanted and didn’t feel comfortable or confident I would achieve the look I wanted through her. The thought of it was giving me relentless sleepless nights. I therefore made the decision to cancel her and enquired with yourselves as I’d received amazing feedback from friends about your work and through your website and instagram I felt confident you would make me feel as stunning as I deserved to on my special day. That was one of the best decisions I had ever made and definitely the most well spent money I have ever spent. I was so happy with my hair and make-up on both days. “Thank you for making both my wedding day and reception party make up look so fantastic. I felt comfortable all day in my hair and make up and had many compliments. You were professional and made me feel like a princess and the photos prove how good your make up was. Thank you again. I would recommend you to any bride! “My wedding day was perfect and one of the major reasons was you Anu, as you made me feel and look like a star! I can’t continue without saying a big massive thank you first!